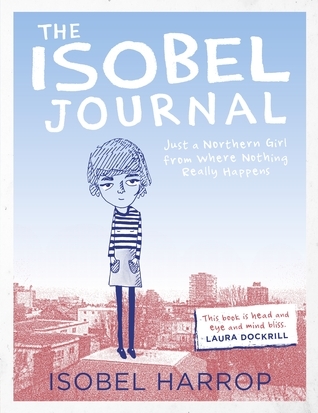 THE ISOBEL JOURNAL is no ordinary snapshot of a contemporary teenage life. A charming and vivid narrative scrapbook of the eighteen-year-old author’s sketches, mini-graphic novels, photographs and captions, it captures her wit, her observations and her creative talent as she takes us through the three central themes in her life: ‘Love’, ‘Friends, Art and Otters’ and ‘Me’. Resonant of Laura Dockrill’s MISTAKES IN THE BACKGROUND and with the powerful naïve illustrative style of cult Japanese artist Yoshitomo Nara, this is a collector’s gift for teenagers and all who have the teenage experience still in their hearts. Readers will emphasise with this witty and honest journal of a girl getting to grips with impending adulthood. A must-have for all hipster teenagers and anyone who appreciates the raw creativity of youth. Enchanting and poignant. The Isobel Journal is a journey through the mind of a 16 year old girl, told in short sentences, scrapbook materials and doodles. It tells a story of an average life, nothing is overly exciting and nothings much happens, but its a good story, because its one that is easily relatable for all. I loved the way Isobel’s life story was told and the fact the doodles took over the book, as mentioned in the book ‘a picture paints a thousand words’ and in this it really did. There was heartbreak evident just through the pictures and ever if there were no words at all a lot of the story would have come across. I loved how down to earth and how solid Isobel came across and I’m guessing its all the authors actual doodles and its her real life, if so she comes across as a brilliant person. I loved the little nudges towards her feelings on current affairs and how feminism creeps into her story and just how much she has caught life as a young person growing up in the north. There isn’t a lot to doing growing up in the north and to be honest I feel like I can really vouch for this. I grew up a lot further north and a lot more in the middle of nowhere than where this book is set. Life was very much about going to school, seeing movies with friends, finding out about local bands and trying to find love. Things happened and they were harder because of the small town nature of the place and everyone knew what was going on all the time. This book kinda catches all of that and catches just how difficult it can be. There’s a sketch in the book that is captioned ‘where we fought for the first time’ and that was more heartbreaking than everything because I felt that it was probably somewhere Isobel would see a lot. There are also brilliant references to tv shows and music that I thought were a brilliant touch, though may make the story age a little bit. The Isobel Journal is a great read. It is a fast read and I managed to fit it into my work day without reading it at home, which shows you just how fast a read it can be! But it is not one to rush. There are subtleties that will be missed if you read it too fast. I will be giving it a second, and probable a third, read to see if I pick up more after reading it again and I would recommend it for any teenager, especially more reluctant readers who love art. The Isobel Journal was published by Hot Key Books on November 7th. My copy was sent to me from the publisher in exchange for an honest review. I really loved The Isobel Journal so it’s good to know that you enjoyed it too. I read it twice in one day and am also planning a third read sometime soon, it’s so lovely to just flick through. Great review! This sounds fantastic, and really different. Must get myself a copy.